As it often happens, I was looking for one thing (Google’s expansion into creating maps and navigation tools) when I came upon another. 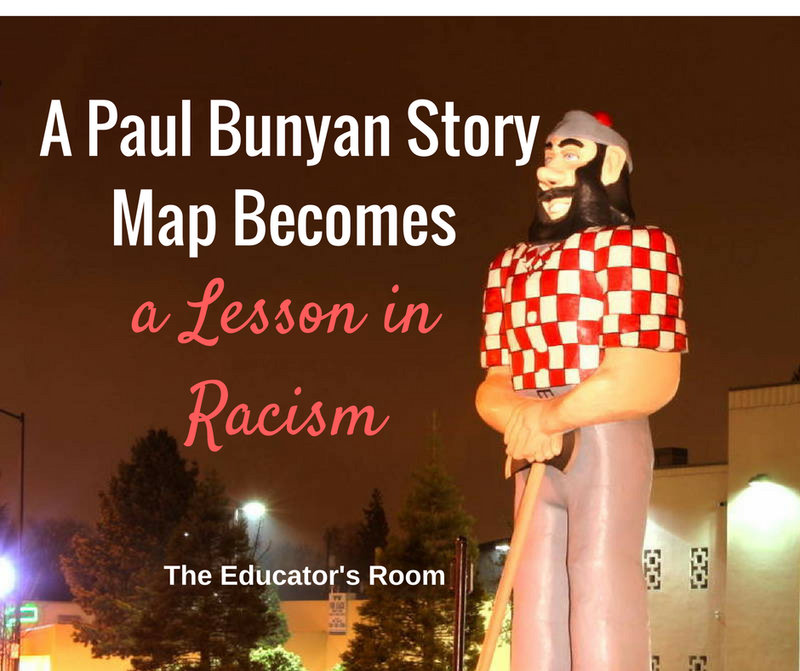 I had clicked my way to a story map of the folk tale hero Paul Bunyan. I had followed a link to the Osher Library Map Cartographic Southern Maine University website and soon was down an Internet rabbit hole, digging around in their map collection. There I found Paul Bunyan’s Pictorial Map of the United States Depicting Some of His Deeds and Exploits created by Handy, R.D. As the literature in Grades Two and Three centers on folk tales, I was thrilled to find this map. I thought this combination of pictures and text would be something to share with teachers. I spent several happy minutes zooming in on the map. There in the lower right corner was the boast of authenticity: “This is to certify that all the facts on this map are without any change or exaggeration,” with several witness listed below. It was just the sort of hyperbole that goes with the stories of Paul Bunyan. In school Paul used a slab of lime stone for a slate and a big white pine tree for a pencil. The 10,000 lakes in the State of Minnesota fill the footprints of Paul’s gigantic Blue Ox, Babe who measured forty-two ax handles wide between the eyes. The Mississippi River was the result of water leaking from one of Paul’s water storage barrels. Paul’s briny tears filled the Great Salt Lake of Utah. When Paul sat down for a smoke to think about his problems, he set off the Great Smokey Mountains. When Babe when digging after a field mouse, he created famous Mammoth Caves. My delight, however, came to an abrupt halt when I got to the upper left hand corner of the story map. There were two small characters in the upper left corner (not pictured) of the map that changed everything. In this upper left corner was a small illustration of what the text described as “two small colored boys.” They were drawn to show how Paul Bunyan’s cook, Sourdough Sam, made “pancakes on a griddle so large that you couldn’t see across it.” The drawing of these two boys who “greased the griddle with bacon slabs tied to their feet” highlighted their simian-like features. The illustration on the map looked like an artifact from a Jim Crow exhibit. Suddenly, my lesson in sharing an American folk tales with elementary school children had turned into a lesson on the history of racism in America. Up until that moment, my familiarity with Paul Bunyan was with his exaggerated prowess as a lumberjack in Northern Minnesota. Some might argue he was a creation more of “fakelore,” a literary invention passed off as an older folk tale. I had never considered that Paul Bunyan was racially motivated. Environmentally unfriendly? Yes. But a bigot? No. Furthermore, research on other sources of the same story of those cooks who greased Paul Bunyan’s griddle yielded accounts that did not mention the race of the cooks. 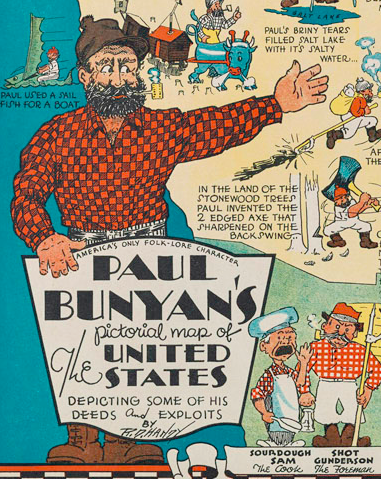 On this R. D. Handy story map, Paul Bunyan was not funny. I was not going to share this story map with 7-9 year olds. The use of this R. D. Handy story map would be limited at best a to high school U.S. History class where students could have the opportunity to discuss America’s cultural past and how that past impacts both the present and informs the future. To be fair, R.D. Handy, author of the map, was no doubt responding to cultural norms of his times. During his tenure as a cartoonist for the News Tribune in Duluth, Minnesota, the Great Depression had hit all Americans very hard. The economy nationwide struggled to improve. The competition between all races for the few jobs available brought added hostility. According to an entry in Encyclopedia.com titled “Black Americans, 1929-1941, “there was migration of southern rural blacks seeking employment in the industrial centers of the North.” In traveling north, Black Americans could escape the racial violence of the South, and some “400,000 made the journey during the 1930s.” This was the historical context when the map was released to the public. The R.D. Handy story map illustrates an American paradox. The story map contains the promise of American exceptionalism in a folk tale, combined with the exploitation of a race in building up that hero. The story map captures the charisma of American bravado stained by American bias. Perhaps the lesson now will be to challenge the second and third grades to give Paul Bunyan’s folk tales another chance. Paul Bunyan needs a new map.